Augusta councilors vote to send proposal for a per bag fee for plastic shopping bags to voters in a referendum question. AUGUSTA — It will be up to city residents whether shoppers will have to pay for plastic shopping bags to carry out their purchases from Augusta stores. City councilors had been considering a proposal to require stores to charge customers a 5-cents-per-bag fee for plastic shopping bags to carry their items out of the store. Instead, however, they opted to let voters decide on the proposal meant to discourage the use of plastic bags in Augusta. Councilors voted 4-2 Thursday night to approve the proposed bag fee only if residents also vote in favor of it in a referendum vote in November. Ward 1 Councilor Linda Conti, the prime advocate for either banning plastic bags or requiring a fee be charged to get them, and At-large Councilor Jennifer Day, were the two votes in opposition. Conti said delaying the decision could be detrimental to the environment and if the referendum is going to pass in nine months anyway, councilors should just vote for it now. The proposal, based on ordinances adopted by other Maine municipalities, including Portland, wouldn’t ban plastic bags as some municipalities, including Manchester, have done, but it would require stores to charge customers 5 cents per plastic bag. The stores would keep the money generated from charging for the bags. Before the vote, resident Jonathan Leach urged councilors to implement the bag fee themselves and not send the matter to referendum. “I’d like Augusta to be an environmental leader,” he said. “We need to start making some of these baby steps that are really essential. Augusta’s referendum question could be made moot, however, if state legislators approve a bill proposing to ban the use of plastic shopping bags in most stores statewide. On a motion from O’Brien, Augusta’s ordinance was modified to state it would not be placed on the ballot if the Legislature passes regulations on the use of plastic bags. 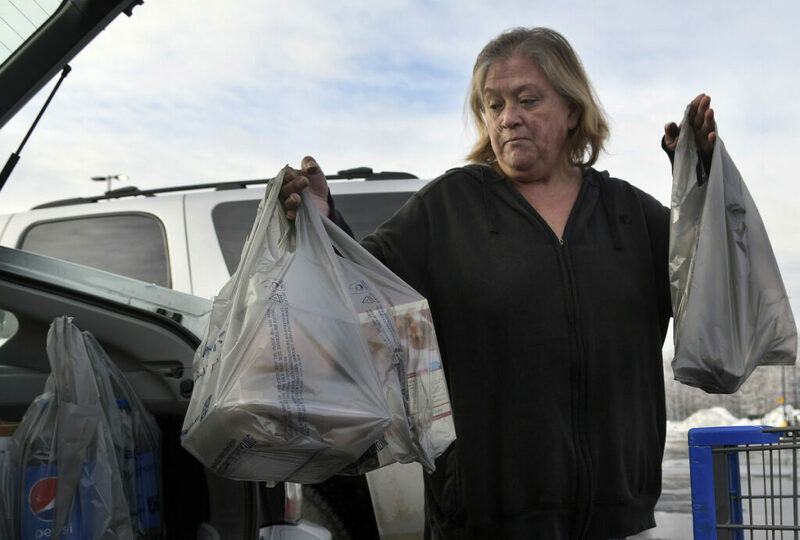 In January, a majority of city councilors indicated informally they would not support a proposal to either ban plastic bags or require stores to charge 5 cents per bag for customers to get one. But Conti said she still wanted to bring a proposal forward, to try to help reduce the amount of plastic going into the local waste stream. She declined to drop the issue in January, saying she wanted the issue to go to a vote, so it would be on the record how each councilor voted on the plastic bag issue. Since then, some councilors who spoke against the ban and fee said they would agree to have the issue go to voters in a referendum for residents to decide.